Aside from getting your skis tuned on a regular basis, waxing downhill skis is crucial to on-slope performance. In fact, many perceived technique problems can often be attributed to skis that are in need of a wax job. A ski that has not been waxed will be slow. You might find yourself catching an edge in certain snow conditions. Most people who experience these problems go to the shop for a tune-up, which usually involves waxing downhill skis. However, in many cases your skis might not need to be tuned, so you are paying for something that you don't really need. If you have ample space and ventilation in your home, you might want to consider waxing your own skis. You will definitely be pleased with the results. Your turns will be smoother, and your skis will be more stable at high speeds. Temperature is the prime factor that will determine your choice of downhill ski wax. Additionally, there are two types of ski waxes; recreational wax and racing wax. Both types are color coded according to temperature. 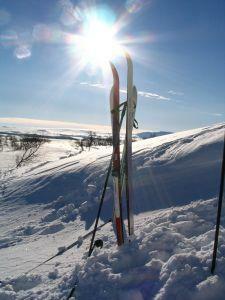 However, racing ski waxes are based on temperature and snow conditions. Red ski wax is for temperatures between 25 and 35 degrees Fahrenheit. Blue ski wax is for temperatures between 15 and 25 degrees Fahrenheit. Teal ski wax is for temperatures below 15 degrees Fahrenheit. White racing ski wax is for temperatures below five degrees Fahrenheit. It's best for conditions with wind blown or powdery snow. Teal racing ski wax is for temperatures between five and 15 degrees Fahrenheit. This types of wax is best for cold, hard packed snow. Green ski racing wax is for temperatures between five and 15 degrees Fahrenheit under humid conditions. Blue ski racing wax is for temperatures between 15 and 25 degrees Fahrenheit. It works best in dry snow, hard pack conditions. Tan racing ski wax is also for temperatures between 15 and 25 degrees Fahrenheit. However, it works best in high humidity conditions. Red racing ski wax is for temperatures between 25 and 35 degrees Fahrenheit. It is designed for racing in old snow conditions. Salmon racing ski wax is also for temperatures between 25 and 35 degrees Fahrenheit. However, it works best with new, moist snow and high humidity conditions. There are a number of tools required for waxing downhill skis. Some companies sell ski waxing kits. You can either purchase the kit, or buy the items separately. If you've just come back from a day on the slopes, you will need to wait at least 30 minutes before waxing your skis. You want the skis to return to room temperature. Failure to do so might result in warping of your ski bases. While you are waiting, be sure to clear the area of any kind of dust or dirt. If dust falls on to your skis during the waxing process, it can create an uneven wax job.When your skis warm to room temperature, place them in the ski vise. Check your skis for gouges and scrapes, and use your p-tex candle to fill them. Pour your base cleaner on to a clean paper towel and clean the bases. Heat your iron to a low temperature. In the meantime, apply a coat of wax to your skis. Then, take your iron and move it up and down over your ski bases. Once the wax has cooled down, use your scraper to remove it.